Manufactured from nickel chrome plated alloy, 1/2″ square drive, with reversible ratchet head. The Ft/lb and Nm scale is engraved on the barrel of the wrench. The micrometer type sleeve allows accurate preset torque levels to be set. 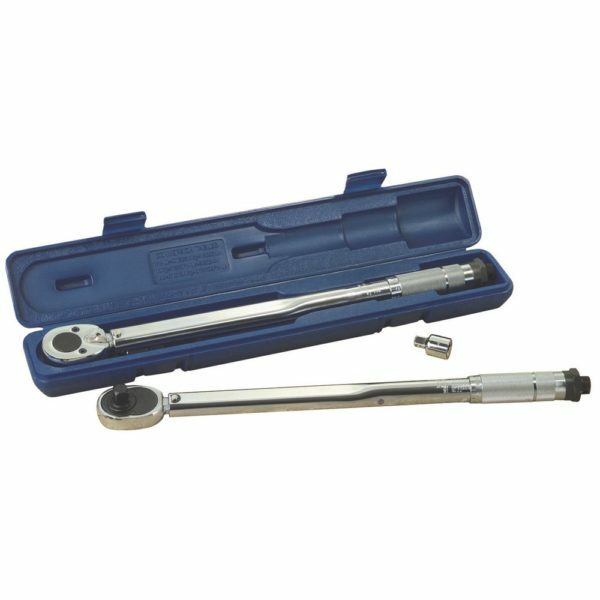 When torque is reached the wrench produces an audible click and a release of tension. • Dual scale torque wrench 10 – 150 Ft-lb, 13.60 – 203.50 Nm. • Can be used in the dark, blind spots, in oil, in noisy surroundings and on vibrating machinery. • No pointer or dial to monitor. • No clumsy gadgets to get in your way. • 1/2″ Drive Ratchet (3/8″ Drive Adaptor Included). • Packaged in a blow mould case.